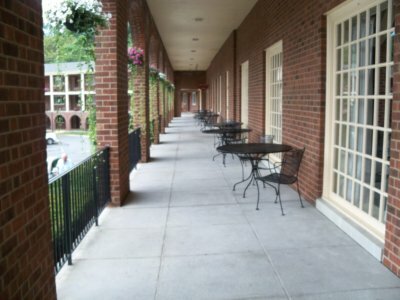 Natural Bridge Hotel - A Unique Experience! Natural Bridge Hotel looks like something out of a Gone with the Wind style movie and I just had to stay there! I wanted to experience this hidden gem and learn the history of the hotel and region. I stayed in a “patio room” which had direct access to the outside much like a motel room. I had my 14 year old Chihuahua, Chico, with me and knew he would need me to get up in the middle of the night to take him out. The numbering of the rooms is a little confusing but I eventually got it figured out and found my room. You also have other choices including staying in the hotel proper. The room had a small bathroom, old style, but adequate with a very small shower stall. Limited counter space had been augmented by the addition of 3 wall racks for the paraphernalia we feel we need in the 21st century such as curling iron, makeup, etc. The room had a musty odor at first but leaving the door open for a few minutes once a day fixed that. 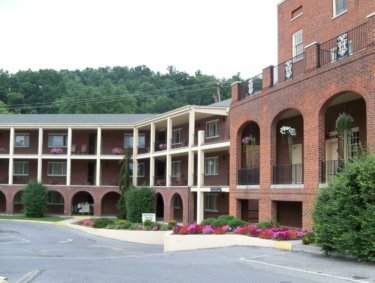 The Natural Bridge Hotel as it stands today was built in 1964 of brick after the original wood structure burned to the ground in 1963. Private investors had built the original three story Victorian style structure around 1906 when they purchased Natural Bridge. Now some will think a structure built in 1964 is really old and “antique”. However, I graduated from high school in 1965 so I caution those folks to think twice before you throw that word “antique” or “old” around too much. If you are expecting to find all the modern, shiny, contemporary fixtures of the best contemporary motels or hotels then you should revise your thinking. This hotel has been refurbished yet it still reflects an era that was more austere and fundamental. That said, my room was furnished with lovely 2 poster beds, a very large dresser and air conditioning! I had chosen the “Escape package” which meant a room for 2 adults staying 2 nights and included a $10 voucher for each adult for each morning.. 4 free breakfasts in their Colonial Dining Room! This was a DEAL since they had unlimited buffet served with eggs, French toast (absolutely delicious!!! ), sausage, grits and so much more! In addition to getting the FREE breakfasts for 2 we also received free tickets to the Indoor, Live Butterfly Garden, the Antique Toy Museum, AND THE NATURAL BRIDGE. A real bargain! Since I love a hearty breakfast I didn’t need lunch and my only meal expense was to purchase the dinner buffet ($18 x 2)in the evening at the Colonial Dining Room in the Natural Bridge hotel. The view from the front porch of the hotel is spectacular. 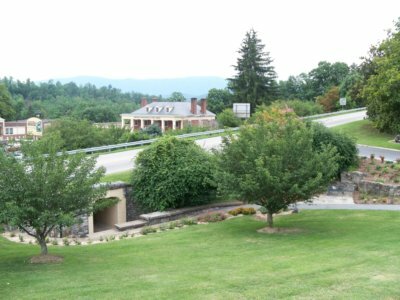 (See above) The Natural Bridge Hotel sits high on a hill and looks down, across the road, to the Natural Bridge gift shop which is also the entrance to the Indoor Butterfly Garden and the Antique Toy and Doll Museum. NOTE: You can also enter the Natural Bridge itself thru the gift shop by going down a really steep set of natural rock steps. I did not realize that there was another entrance that would have been much easier on my legs and knees. If you have trouble walking be sure to ask about the other, easier access to the Natural Bridge path. It isn't as scenic but your legs and knees will thank you!!!! Notice the small tunnel in the lower part of the picture. There is a lovely, romantic path complete with lavish landscaping and flowers available for you. The path leads to the tunnel and you walk under the road over to the gift shop. Very convenient!! 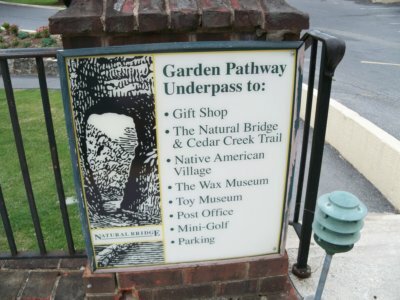 The path starts at the edge of the parking lot of the Natural Bridge Hotel and is marked by this sign. Oh! How I wanted to see a wedding taking place! It would be such a beautiful back drop for a wedding! 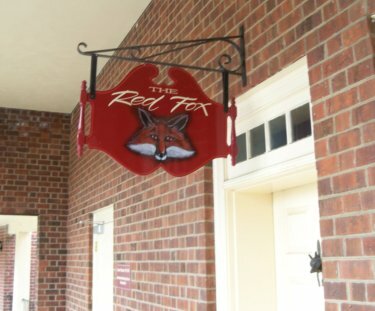 The Red Fox Inn has wine tasting parties. Be sure to stop in and sample the fine Virginia wine they serve! Beautiful flowers everywhere.. I don't know how they do it - keep all those hanging baskets looking fresh and pretty! My visit to the Natural Bridge Hotel was a delight! There is so much to see in the area and this hotel is at the center of it all. If you have visited and stayed at this hotel please take a moment to share your story! 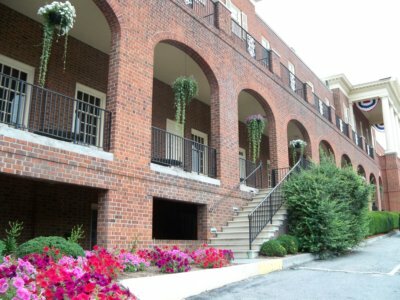 What was your favorite part of staying at the Natural Bridge Hotel?